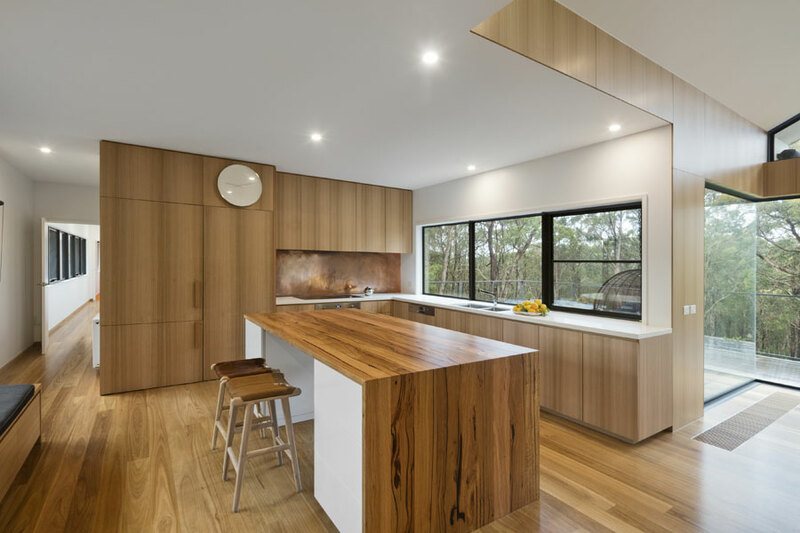 Rowan Opat of Opat Architects was approached by his clients to do a simple update to their holiday house in regional Victoria, and from there, the small project snowballed into a new home away from home that is considerate of its surrounds. ADR: Where is the property located and how does it fit into the surrounds? Rowan Opat: The property is in a semi-rural area of Victoria, Red Hill South. The site is surrounded by greenery and agriculture and it rains a lot there. The house is designed to minimise its impact on the site and operate as a kind of hidden secret, a bit like a treehouse. The house is anchored to an already excavated part of the hill, with trees all around. 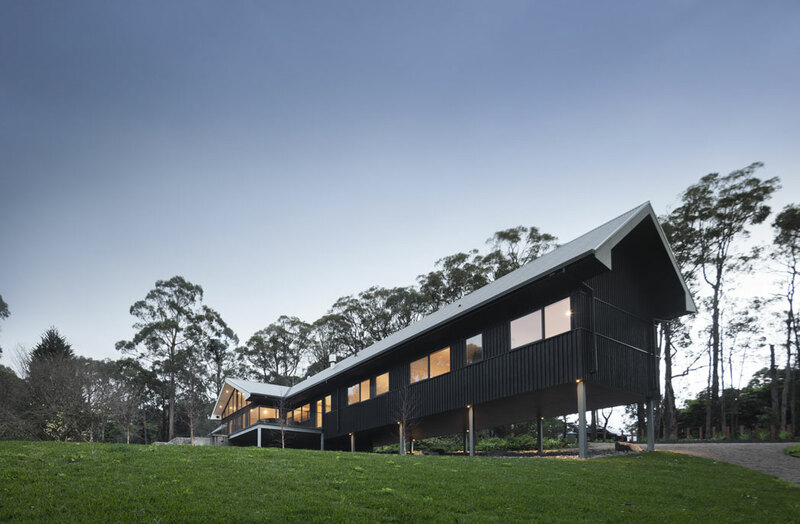 The building is carefully orientated to minimise the impact on trees and to maximise passive solar design opportunities and views to the south. 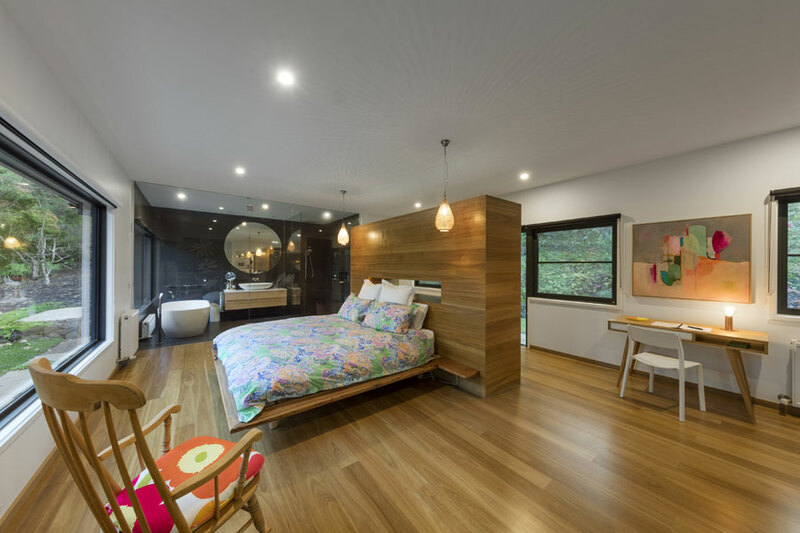 This idea of being surrounded by nature played into the positioning of the master bedroom, which has windows that look out to an old golden elm tree. The existing slope of the site was utilised with the new build. 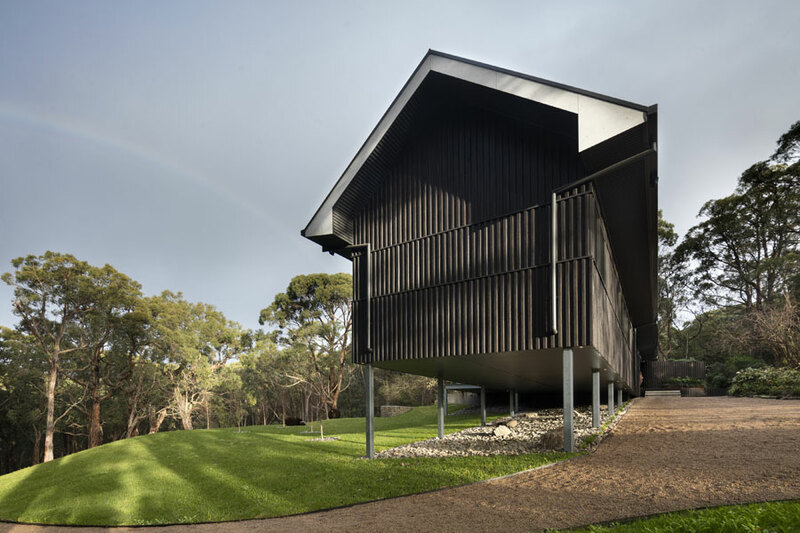 The dark colour scheme of the exterior was chosen to allow the house to blend in with the blues, browns, purples, greys and greens of the native bush surrounds. The site has a significant slope. There was an existing house that was partially cut into the site. The new house is located to recycle the existing cut and impose a north/south orientation. What was the client’s brief when they approached you? The client had an existing holiday house on the site but it was old, wet, cold and not fit for their purpose. They approached me, initially wanting advice on new paint finishes for the existing house. Needless to say, things just kind of grew from there. Over time, the brief developed and it was really apparent that they wanted a light, airy and warm home that they could entertain and be comfortable in. Now they pretty much live there. They’re definitely staying as often as they can, even Reggie the dachshund loves it. How does the design respond to the brief? In trying to warm up the building, it was essential to make sure the orientation worked for passive solar, but also to open up the southern views. Being a holiday house, the selection of materials throughout is robust, low maintenance and economic. There is no mains water, gas or sewerage, so the house is designed to satisfy all those needs, collecting water and treating sewerage on site. It was important to consider how the design could make these necessary services discrete and hidden. Our design process oscillated between plan and section, optimising and simplifying. The master quarters and guest wing are separated by a large common area. Adding to the sense of privacy and separation, the master’s quarters is also discretely accessed by a door disguised as a wall panel. The dormitory wings are easily separated off from the central living area. The master suite has privacy from the rest of the program. The roof form was designed to be constructed of a simple lightweight roof truss. The roof explodes up and opens over the living area. Deep eaves are designed to provide a vast insulating volume, keeping the house dry and warm, while helping to shed leaf litter. The roof pitch is designed for future solar electric panels. A typical window level was wrapped around the house. That window band was expressed as a shift in the cladding line that wraps around the house. 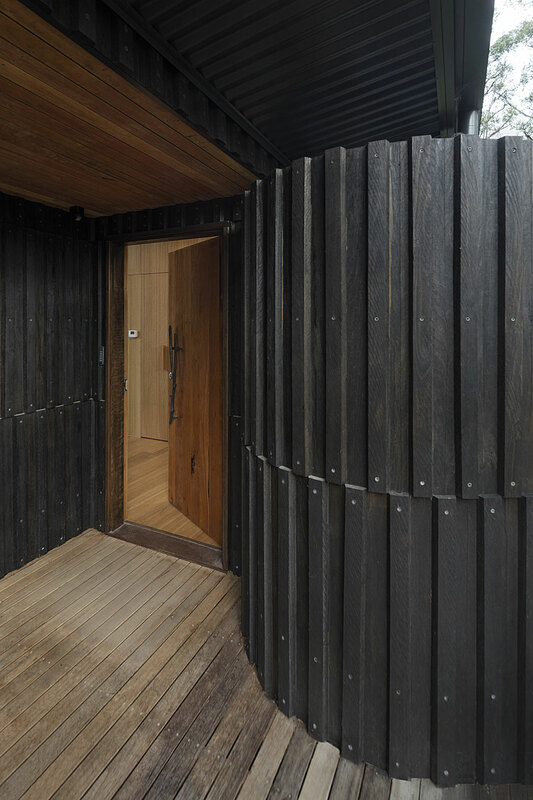 The front door is expressed as a buckle in the external wall that is, in turn, stripped out, forming a private courtyard to the master’s quarter. 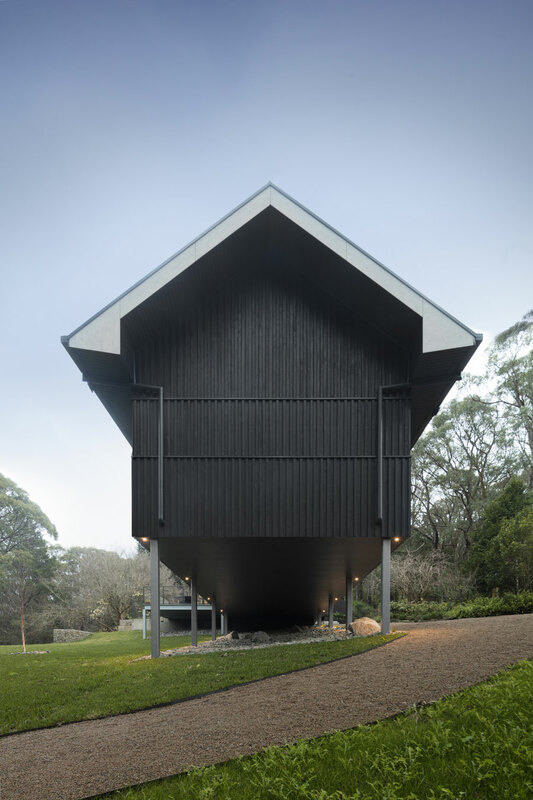 You’ve used a black timber cladding, can you talk through the material selection? The external cladding is a radially sawn board and batten system. The timber is a naturally durable regrowth hardwood. The painted timber board and battens are a robust, long term, economical solution that met stringent bushfire regulation requirements. 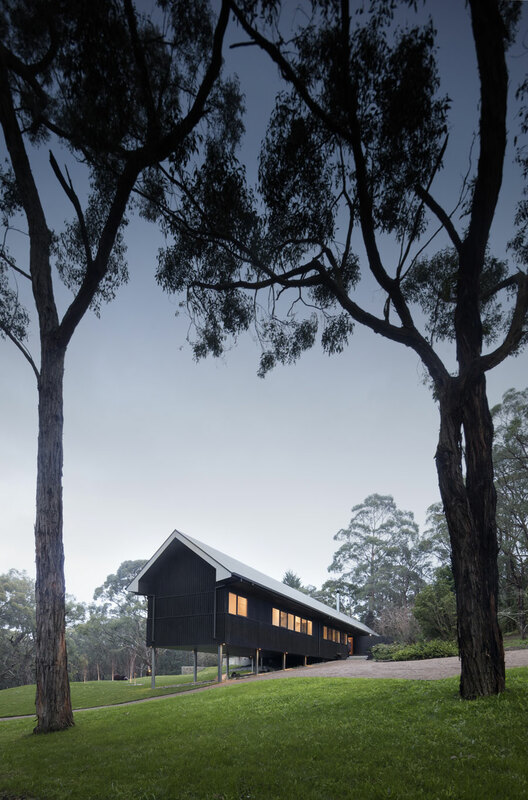 The banding and detail were intended to play in the light and shadow of the surrounding gum trees. The roof has a steep pitch, which helps with the leaves, particularly as it is a holiday house and needs to be low maintenance. Built by Simon Coleman at ecoast. Read about a series of small scale holiday homes that use clever design to make them feel big.